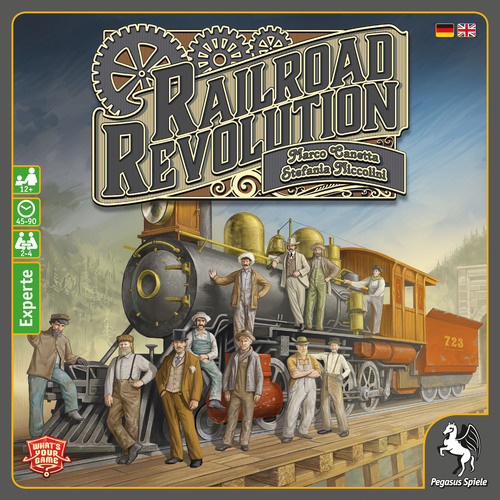 Railroad Revolution* is a route building and worker placement/action selection game set in 19th Century America, when the railroad and telegraph companies were racing to connect the country coast to coast. It is very much a mid-weight euro game with quite a few moving parts, but equally it’s not that far above gateway game level. It takes 2-4 players, around 12+, with games lasting about two hours (or a bit less with fewer/experienced players). It comes in a large box (think Ticket to Ride) and will set you back around £40; about standard now for a game with this level of components. Inside you’ll find a board (OK artwork, but clearly laid out); 200 wooden pieces; close to 200 cardboard tiles; and four player boards. The quality and iconography throughout is all what I’d call industry standard now – very high quality, without being exceptional or outstanding in any particular way. 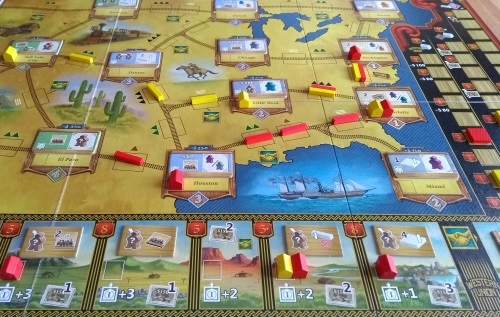 As seems to be the way with most mid-weight euros nowadays, Railroad Revolution requires you to teach everything before you get started and you can pretty much guarantee people will be glazing over by the end – but you really need to do it. The game isn’t that complicated, but it’s the kind of game where you can do pretty much any option on turn one – so people (especially the ‘competitive on game one people’) really need all their options laid out. But don’t be scared off – once you’ve got all these basics down, the game isn’t really very complicated at all. Again, as with many modern euros, it’s all about making the most efficient choice each turn from a large number of actions. To give an idea of the extent of this, only about half the 16-page rulebook is actual rules (which are heavy with images and examples): pages 1-4 are components and setup, while 14-16 are tile and icon explanations (which is actually very handy – the rulebook is very well laid out). You’ll know if that kind of game appeals to you! Actual turns in Railroad Revolution are short and snappy (think Rosenberg, Gertz): choose an available worker and use them to either lay track, build a station or telegraph office, or trade (get free money). Each player starts with a certain amount or tracks and buildings, and when one of you has used a certain amount of both the game end triggers. The real key to the game is having five types of worker available to hire; the crappy white guys you start with and the far more useful coloured ones you get throughout the game. While each of the four actions is standard, you will get a bonus depending on which coloured worker you use on it – hence the big rules overhead: all four actions, and all 16 of those bonus actions, are potentially open to you on turn one. You need to get across that using these bonuses well is the key to victory. They’ll do everything from saving/giving money to letting you do extra actions by paying more; to switching the colours of your workers to raising your end game scoring opportunities. Doing the right things at the right times will keep your engine purring – while a few missteps will see you ‘wasting’ turns having to grab a trade handout. At game end you’ll score points in two main areas: milestones and performance tracks. Milestones are tiles each player has that reward you for doing certain basic actions (building or connecting certain stations) – and once you’ve done one, you get a more difficult one to go for next. Performance tracks reward doing the three main actions – laying track and building stations/telegraph stations. For these you use bonus actions to push up multipliers; so if you’re going for building stations, you’ll try to push its track right up to the ‘x9’ space (so you’ll get 9×9 – 81 points – if you’ve built nine stations). The writer: Railroad Revolution’s variable setup is crucial to its replayability. Both telegraph and train stations are put out randomly at the beginning, making certain routes and pairings more desirable depending on your strategy (you get bonus points for building certain telegraph stations that are next to each other, while building track right across the board will gain you end game points). The variable milestones also help here, encouraging routes you may not have considered. The game definitely feels like a puzzle each time, where the competition comes in the most abstract and non-contact form you’ll find. The thinker: While I enjoy the challenge of a good efficiency mid-weight euro, and very much enjoyed this one, I see it falling off a cliff in terms of interest in the same way Russian Railroads and Lewis & Clark did for me. All the variable setup in the world can’t make up for the spanners thrown in the works by other players and once you’ve explore the various three or four strategies on offer here I see very little in the way of continued enjoyment beyond the hope of expansions. A good game, but one with a limited shelf life – but is that a problem in this ‘cult of the new’ era? Discuss. The trasher: don’t come here looking to put the ‘revolution’ in your railway game! This is largely multiplayer solitaire, with the exception of the ‘deals’ mechanism. The game has two forms of currency – shares and cash. Shares can be traded for cash at any time, but never vice versa – and you have to have shares to make deals. Deals are interactions you can trigger by doing certain actions, and when you do you’ll get the most potential benefit – but others can profit too. This means timing can be crucial, as if you do it when others are low on shares you can really make hay. The dabbler: While on the complex side for me, this is much more Caverna than Agricola: if you run out money or shares, simply spend a turn doing an action that will get you more cash to spend. Every player can go into every space so there isn’t any blocking either – you’ll just get s slightly smaller bonus if you go somewhere second, and even that can usually be offset by using the right coloured worker. So you can happily just wander along doing what you like – and only really see how useless you’ve been when they add the scores up at the end! One oft-made criticism of Railroad Revolution is the dominance of a ‘Western Union’ strategy: building telegraph stations costs no resources while giving good points, making it a no-brainer to build all the telegraph stations alongside a lot of track to use up all your pieces – largely ignoring milestones and train stations. There is an approved variant available to make this more difficult to achieve (it basically makes it harder to get to the highest multipliers for that particular score track), but it doesn’t really fix the issue for better players. Also, building a few less telegraph stations to instead make train stations that complete milestones is potentially higher scoring, if harder and more risky. This strategy has been reinforced by a second approved variant that allows a player to look through all available milestones and choose one – meaning they have a much better chance to get one that syncs up well with those already completed. My only real issue with the game’s production is the odd choices used in portraying money values in the game: everyone I’ve played with has found it counter intuitive. If something says -$300 it means you have to spend $300 to do it; while a + means you get money back if you do something. This really jars with people, as they expect a ‘-‘ to be a discount of some sort. Finally, some say the game is just ‘meh’ and doesn’t bring anything to the party. I disagree. While it certainly isn’t for everyone, if you like this type of game – and don’t mind a generic, pasted on theme – the way the workers give their own bonuses makes it well worth trying. 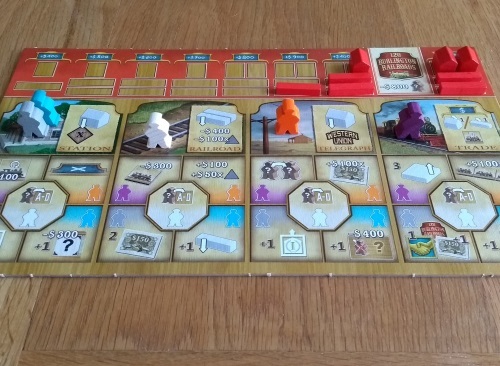 If you like thinky euro games, and are the kind of player who plays a give around five times before moving it on – or have a massive collection where most games only get played once or twice a year – I’d say Railroad Revolution is well worth a look. It has that satisfying euro heft, where it feels as if every decision counts; while the snappy turns keep things flowing along nicely. But after six plays I’m starting to feel as if I’ve done with it, as much as I enjoyed those plays. I don’t think it’s a game that will be staying in my collection, but I’ve very much enjoyed my plays up until now and would never refuse a game. * I would like to thank Pegasus Spiel for providing a copy of the game for review.